Gumové kryty stupaček bílé (perleťový odstín) pár. Kryty jsou podélně žebrované a nejsou přerušené. Při jejich aplikaci se nemusí upravovat. 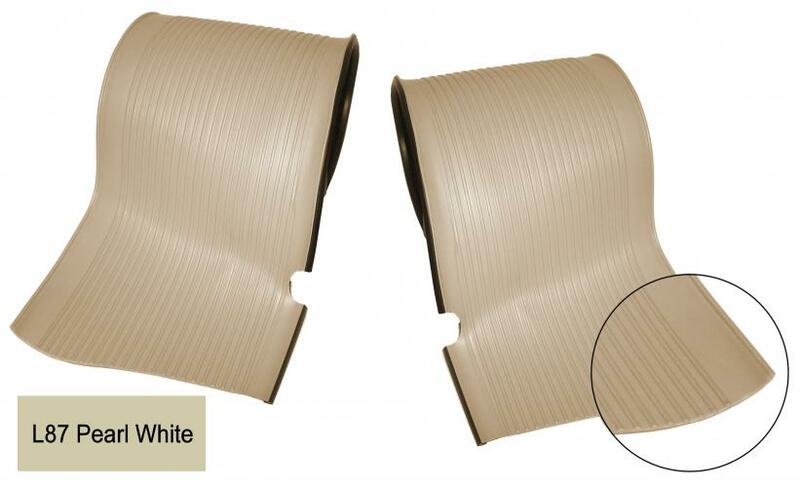 Ribbed trim, the rubber footboard cover is available separately and not just in black like new running boards is the case, but also in several other original colors. All running board trim fits every step of every year. Listed building years indicate this when Volkswagen has applied and with what body color that most match (the black coating was with all exterior colors combined). The running board trim until 10 March 1953 and from April 1953 to 7/1960 has a different ribbed rubber and a higher content than the years of construction below. The upholstery until March 1953 as an exception should further be cut to size and is not cut and dried, other upholstery mats are ready for assembly. Are a pair delivered for the left and right footboard. Gumové kryty stupaček v černém matu pár. Gumové kryty stupaček v červeném matu (odstín pelikán) pár. Gumové kryty stupaček v modrém matu pár.